From global causes to local ones, we’ve always taken pride in giving back to the community. Metallica has played concerts and festivals such as The Bridge School Benefit Concerts, Live Earth, Global Citizen, and Band Together Bay Area. The band has also donated proceeds from ticket sales and album releases to various charitable organizations including Fondation de France’s Give For France and Gilda’s Club NYC, and met with many Make-A-Wish participants. 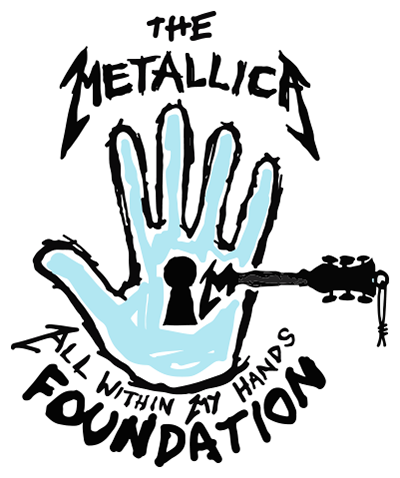 Long time advocates of local food banks, Metallica and All Within My Hands give back at every tour stop in North America and Europe, and in 2016 celebrated the release of Metallica's Hardwired...To Self-Destruct with a series of five shows, donating proceeds from all ticket sales to food banks in New York City, London, Toronto, Los Angeles and Oakland. All Within My Hands is taking things to the next level. While the band will continue to support various causes, AWMH is intended to have an even greater impact through a sustained and focused philanthropic commitment and hopes to inspire others to join us in making the world a better place through local community support. In addition to partnering with local food banks, AWMH closed out 2018 by launching the Metallica Scholars initiative in conjunction with the American Association of Community Colleges in support of workforce education.